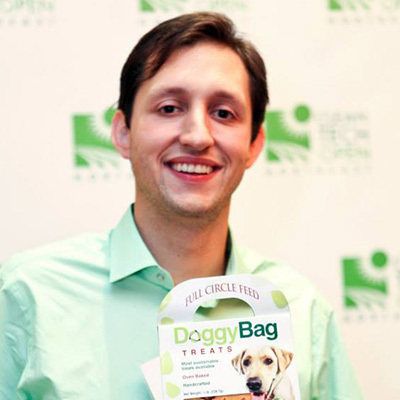 A dog treat company founded by ESF alumnus Michael Amadori won Green America's People & Planet Award. Full Circle Feed, which produces environmentally sustainable dog treats, was recognized for its dedication to a green economy - a bottom line that includes protecting workers, communities and the environment. The honor includes $5,000 in prize money. According to Amadori M.S. '12, the company's mission is to make the world a better place for pets, plants and people. The dog treats are made with vegetables, meats, fruits and breads from restaurant buffets that were prepared but not served. "Full Circle Feed will use the funds to set up a more environmentally friendly production process and drying method," said Amadori. "In particular, instead of electricity or natural gas we plan to use waste heat or biogas generated from anaerobic digestion to bake our dog biscuits. This will greatly reduce our ecological footprint and give us the most sustainable dog treats on the market."